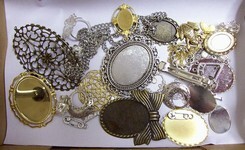 This category contains jewelry finding stampings, jewelry filigrees, charms, filigree pendant drops for making jewelry. 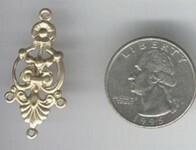 Filigrees are actually made by metal stamping usually in brass. Stamping with metal dies is a typical way filigrees, drops, charms, connectors and some cameo settings are made. 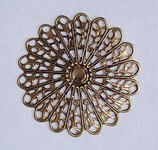 Brass is often used because it is soft, and does not rust. Steel is also used and is common in less expensive stampings you see from China. Most of these stampings are plated. Brass ones can be polished to a bright shine and dipped in lacquer to prevent tarnishing, or you can finish them in some way yourself. I have seen people paint them or use one of the antiquing solutions available.